New Zealand's Jewish community outraged after local mosque leader says Mossad is behind attack on two mosques in Christchurch. 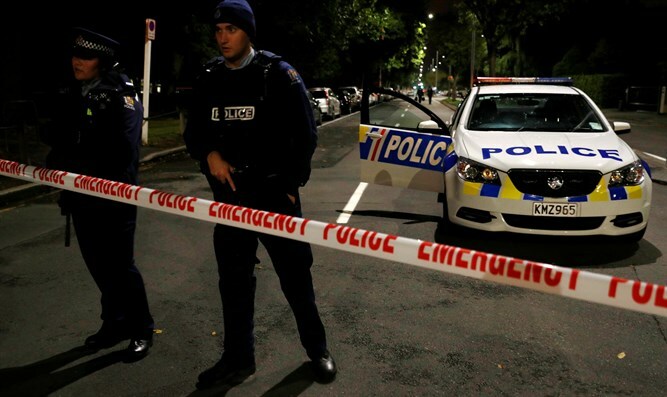 New Zealand's Jewish community is outraged after a prominent mosque leader blamed the Israeli Mossad agency for being behind the terror attack on two mosques in the city of Christchurch, the Newshub news website reports. The incident took place on Saturday during a rally organized by a group called Love Aotearoa Hate Racism in Auckland's Aotea Square. Ahmed Bhamji, chairman of the Mt Roskill Masjid E Umar, gave a speech questioning where the gunman got his funding from. He said he suspected it came from "Mossad" and "Zionist business", according to Newshub. "I really want to say one thing today. Do you think this guy was alone...I want to ask you - where did he get the funding from?" he can be heard saying in video footage. "I stand here and I say I have a very very strong suspicion that there's some group behind him and I am not afraid to say I feel Mossad is behind this," continued Bhamji. A video of the speech was posted to Twitter, causing outrage in the Jewish community. "Conspiracy theories - particularly the idea that Jews (whether through the Jewish state or otherwise) are a malevolent controlling force in the world - are at the very core of anti-Semitism," she added. Asked whether he agreed with or believed the theory that Mossad were behind the attack, Carolan told Newshub "absolutely not". Bhamji defended his speech, saying an inquiry is needed into where the alleged gunman got his money from. He did not offer any proof to his speculation Mossad had funded the alleged gunman. 50 Muslim worshipers were killed and at least others were 20 injured in the shootings at the Al Noor and Linwood mosques in Christchurch on March 15. After the attack, a Qatari sociologist posted two videos on his popular YouTube channel in which he claimed that the Jews instigated the massacre against Muslims in New Zealand in order to create discord between the Muslims and the Christians. Immediately after the attack, Jewish groups from New Zealand and beyond expressed their horror over the massacres at the mosques in Christchurch. The New Zealand Jewish Council said it is “sickened and devastated” by the attacks. World Jewish Congress President Ronald S. Lauder expressed “horror and revulsion” at the attacks. “I extend my deepest condolences to the family and loved ones of the victims, and to the people of New Zealand. We must redouble efforts to combat hatred and division in our societies, from wherever it emanates,” he wrote in a statement.